Free shipping over RM 69 purchase. 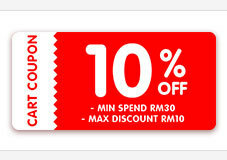 Shipping fee is free when purchasing above RM 69 in a cart. It is a great pleasure to serve you. We are a Chinese seller and we are having great sale in Qoo10 now. When buying in Qoo10 or any online stores, we understand buyers may have many questions on sizes, colour, material and availibility. Before making a purchase, you may contact us by email if you have any doubts or quiries, we will answer your questions accordingly to ensure all our customers have a pleasant shopping experience with us. all have received but some cloth is not my order . Highly Recommend Good quality and fast delivery. Item just arrived.in good quality (very nice), will buy again. Thanks seller. The T-shirts is very good quality..like it very much and good price also. Hai..when's is my item will be delivered?